Xue Xinran’s work is remarkable, not least for the way it has retrieved the lost narratives of Chinese people – and particularly women – in the twentieth century. 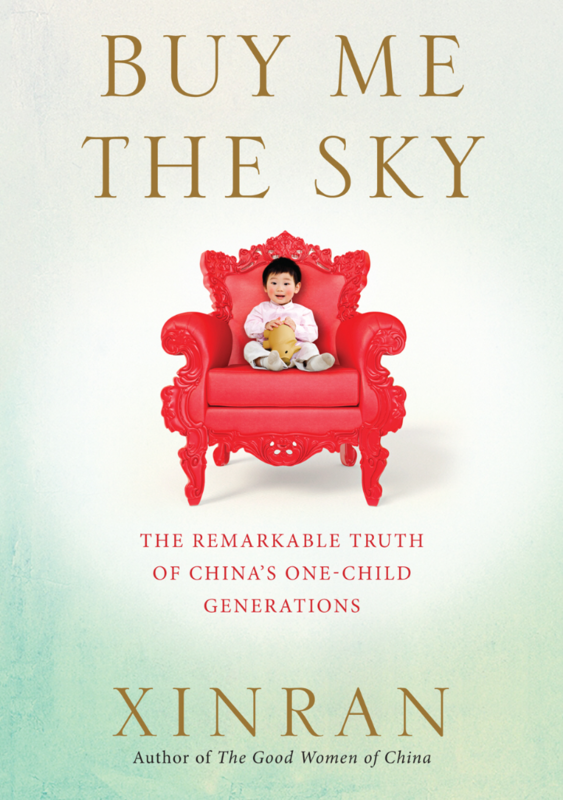 Her latest book, Buy Me the Sky, relates the true stories of children born under China’s one-child policy which over three generations has had a profound effect on the nation. The book reveals the policy’s unintended price to China - broken continuities of parenthood, family, community and tradition. Xinran, herself a product of the policy and mother of an only child, recently spoke to the ALR. She talked of her passion to articulate the experience of her people and in so doing, she revealed both the steely determination of a committed journalist and a mother’s indomitable spirit. ALR – You bring a strong personal voice into your work. In Buy Me the Sky the people you talk to are strongly presented, but Xinran herself is a major character. ALR – You’re pretty hard on your character Du Zhuang. You’re quite blunt and critical. You say, ‘Appreciate your parents!’ and lecture him on his parents’ sacrifices. You demonstrate an interesting balance between looking critically at him and showing your love. Is this something in your character, or something you deliberately wove into the book? Xinran – Well, you know, I too come from the single-child policy and I have an only son. Sometimes I too feel very lonely because I didn’t know how to be a mother until I had this boy. And even then, I had no idea. I follow him to learn what I should do. I realise now that in China, lots of parents, and particularly those from the one-child policy, have many things in common. Number one is a huge fear, because we have no way to learn. The elder generation had three, four, even seven children, and when you ask them, they just say, ‘Oh, don’t worry! Just let [them] be!’ Because after so many children, my mum, and my grandmum just said, ‘This is nature! Life! Why do you worry about it?’ But when you ask people my age, like Du Zhuang’s mother, we’re all scared because we don’t have a chance to replace this child if there’s something wrong. You know, everybody panics – it’s like a disease that can spread out over the whole society. Also, Du Zhuang’s mother is much tougher than me. She said to me, ‘I told you a long time ago; you shouldn’t give freedom to your son. Look – he chose a life, he’s so poor. If you’d forced him to go work at a bank, he would be married by now!’ People always learn about society from brothers and sisters and parents, but only children don’t have that. Then, because only children’s parents never really gave them real society, they overprotected them – you can see how overprotected Du Zhuang was by his mum. So I thought maybe we should give him some balance, to let him feel that society is not just like his mother and father. Believe it or not, in Chinese culture we always say, call this woman mother, call that man father - many, many Chinese children have many, many mothers and many, many fathers. This is our culture. So I thought I could give Du Zhuang a bridge between his protective parents and the real challenges of society. ALR – There’s a vacuum – you describe it as a ‘black hole’ – where there is a sense of emptiness and a lack of continuity in the family culture. It seems to me that in this book you are trying to fill that ‘black hole’. Xinran – I do feel that I’m struggling with this myself, too. I never thought I could try to fill that black hole. I think it’s like when children learn to drive. After they’ve got a driving licence, many of them think they can drive well. But actually it’s not about how good you are [with the test], but how well you react on a busy road to other people’s driving. You learn the rules and then learn how to react to other people, to follow the rules in a different way. I remember my driving instructor saying, ‘Forget it! Ninety-nine per cent of people on the road, they break the rules for all kinds of reasons, and you have to learn how to react to that to make both sides safe.’ For myself and for those children, it’s like you need to sit behind or beside them and accompany them a little bit to make their parents feel safe. Sometimes I hope someone will sit next to my son as he drives into his world. He never allowed his mum to sit there, you know! Nowadays, because China changes so fast, these children have been shaped by the belief that they can change the world as easily as China can change a street. ALR – You talk in your book about the pace of physical change as well as the disappearance of the family network, but also about the loss of a sense of history: everything is new. Xinran – Yes, this is very worrying. Even if a family had some problem, you still had traditional life to compensate. Now you don’t have that. It’s become a cultural desert. ALR – You’re quite critical of many changes that have taken place in China. Does that make it difficult to get back to China, to stay connected to the people you write about in your book? Xinran – That’s true. To start with, I’m a generalist. I never thought of myself as a novelist. I’m not good as a literary writer at all. But as a generalist I believe, first of all, I must have independent thinking. Secondly, I should be fair to all sides, not just one side, of the story. Thirdly, I should have the basic view and knowledge to analyse from the roots to the direction of the future. Based on these three things, from the 1980s I started to question the government and I got into a lot of trouble. I never became a Communist Party member and a lot of people couldn’t believe that, because if you don’t join the party you’ll never be promoted. After twenty years’ work I got a little bit of a name there, but I never got promoted because I couldn’t join the party because of my independent view. And I had trouble. I was stopped many times, I was intimidated, and someone even sent a live bullet to me in the post. Once, when I was running my radio show, I was forced to stay in the radio station and not go out for two weeks because someone was waiting for me – until the police caught that person. Yes, I had this kind of experience. In the countryside, a peasant said to the policeman who drove me there, ‘Can I buy her?’ I thought it was a joke but in the night he really seriously came to break in and tried to steal me away. This is China! And in China - not only in China, in many countries – we have self-censorship. We censor something because we fear the consequences. But for me the greatest fear is that, because we had civil war from 1911 all the way to 1976 with the Cultural Revolution, most of the valuable historical archives were destroyed. After the Second World War lots of archives survived in Germany and other countries, and we can see what really happened, but in China we have lost almost a hundred years. As the older generations passed away families didn’t want to talk because no one talked, or because they were ashamed and afraid of their children’s questions. The Chinese new generation has been cut off from real history. They haven’t had the chance to think for themselves. That is a disaster for any nation. Once, I was standing in Tiananmen Square and I gathered a group of students and asked them, ‘Who can tell me, what is the Cultural Revolution?’ Only one student said, ‘That was something that happened in the 1960s, about politics.’ Others said, ‘Oh! Anti-Japanese!’ or, ‘The Korean War!’ I am still in shock about that. Day by day, after thirty years, I’m learning, not from pages but from people’s life. During some interviews, some people – they’re seventy, eighty, ninety – shouted so loud the whole building could hear. I was worried about their health so I called their families after the interview: ‘How is he? He was very emotional.’ ‘Oh, she’s OK. She cried a lot.’ A hundred per cent of the families told me that, after the interview, their grandparents’ blood pressure came down. That means they had this bottled up all their life. Many children said, ‘Oh, that generation did stupid things, made China so poor. The stupid communists made China so poor.’ This made their grandparents very regretful. It was very painful for them. But after that kind of civil war, they were so poor, like the whole of Europe after the Second World War. Everybody had to pick up bricks from broken buildings. But the children can't see that, because there’s nothing in their history books, textbooks or in the classrooms; nothing in the society or in the media; and nothing in the family. No one could talk. So children couldn’t understand it. ALR – You’re setting an example as a catalyst for positive change, for knowledge and understanding, so that people can find out for themselves. Throughout the book, you keep sending people to ask their parents, to question themselves. That’s empowering. Xinran – Thank you. I think the authorities try to make China seem like a very peaceful lake. But many people think that that is not water; because it’s so peaceful it’s just a mirror. Actually, there is life in the water. I want to throw tiny stones so people can see that this is live water, not a mirror. When you realise it has waves, it has fish, it has millions of live beings inside – then you can believe it is not a mirror. ALR – Some Chinese people say that the Cultural Revolution, the one-child policy, the Tiananmen massacre and the repression of freedom of speech were all difficult but necessary preparations for China’s current prosperity. Perhaps this is why these events are hidden beneath the mirror of the ‘peaceful lake’. Xinran – I understand their point. The West spent over 250 years getting to the democracy system. In China, let’s be honest, it’s been less than a hundred years. We turned this country from Imperial to Communist straight away. Many people, when they talk about the way of water, they try to imagine a sea. If you suddenly bring that sea to millions in an open society, that will bring death. My point is that water can be sea, river, lake, stream – many shapes, many sizes. So if a lake is surrounded by a beautiful view of mountains, it has lots of nice things but you can’t make the water into a mirror, everything beautiful. Water is full of life. It’s very important for children to understand that they share this life, and can’t just take a reflection from the mirror. ALR – Some people might say this ‘generation gap’ happens in every culture. What makes China stand out? Do you think it’s the one-child policy that has done the most damage to China’s future? Xinran – I totally agree that every nation has this problem. But if we really want to challenge ourselves – if we think we’re educated and we have confidence that we’ve done good in our lives – we should share with our children because we believe children should be cleverer than us, better than us, and move on to a higher level than us. But if they don’t know what mistakes we have made, they will repeat them. I won’t say that the one-child policy was just a mistake, because during those thirty years we reduced the population by some 400 million. Without this policy, China would not have had time to breathe, to recover from the fall in living conditions after the Cultural Revolution. That would have been a big danger to the world. And we would be living in much more pollution, too. So these things are good. When you bring in a policy to the country, you need to set up a society that will help families to understand the change. In the last generation before this policy, Mao encouraged every family to have more children, and they lived in this belief. Suddenly, just four years later, they said, ‘No, you can only have one child.’ They needed to ask, ‘How can we help them, the mother, the parents, at kindergarten, at school and in society?’ We needed a system between government and the family. This is why many families suffered fear and panic. They had nowhere to ask for help. ALR – In Buy Me the Sky, you say, ‘I have observed an endless stream of good women, but barely a handful of good men.’ Of all the problems that China faces, how important is this? Are women the future of China? Xinran – In The Good Women of China I talk about how men are like a rock or a mountain, and women are like water. Without water, men are a wasteland; but without mountains, women could be a crazy sea. Because of the rocks and the mountains, women can become a stream, river, lake with all their shapes and sounds. With water, mountains can have trees. Even on the top of mountains, water can make a tree grow. And that means men and women can’t live apart from each other. I do believe, though, that Chinese women play a more important role than men in cultural terms because we had a very difficult past, partly because of Confucius. He said, ‘Woman! Come on, you are at the bottom. You even have to listen to and obey your son, because he is a man.’ So they never gave a fair position to women, all the way to Mao, who was perhaps the first man in Chinese history to say that a woman could hold up half the sky. It’s not a man’s fault to be born with this belief. But then they believe they can shout at their mother, they can beat any woman. It’s their human right! This is one reason why it’s difficult for them to be equal. In China over the past thirty years we recovered so much, so quickly, and became so strong. Don’t forget, that came from Chinese mothers. It was Chinese mothers who, generation after generation, passed on the philosophy and cultural beliefs to their kids, but fathers had no time for kids. They had to go out to fight, to be heroes – for justice, for being right. Mothers have never fought for right, just for their kids. I’m really proud and touched that Chinese women, many without knowing it, carried on this beautiful tradition and rich culture to the next generation. Without them, China could not have survived. ALR – Why is your charity, The Mothers’ Bridge of Love, for adopted Chinese girls – so important to you? Xinran – As I travelled around the world, I met Western families who brought their baby Chinese girls to me. I did some research and I found that 150,000 Chinese girls had been adopted into Western countries. No matter which country they were in, how old they were, which language they spoke – they all asked me a question I couldn’t answer. They asked me, ‘Why didn’t my Chinese mum want me?’ I didn’t know how to answer that question. So I set up the charity to help children be proud of Chinese culture and have their own Chinese network so they can find their lost family in future travels to China. We also wanted to get them involved in our library project in China. In modern society, we live the screen life in our cities - with computers, iPhones, and iPads. But in China we have a lot of kids who have no electricity. Paper and books are so important for them. And it’s the best education. If there’s no one to teach them to read, there are picture books. There was one gentleman who was very interested in the little picture library in the village. The first time I saw him he said, ‘I now allow my granddaughter to eat with me at the same table!’ Before, no girls or women in that village had the right to eat together with the men. I said, ‘How did you do that? And he said, ‘I saw the picture book you gave to me. Those big-noses have their girls eating with them at the same table!’ You know, that is education. Now I invite many adopted children and their families to go to China, stay with Chinese families in the cities and see the wealthy life. Then we carry the books to the villages by long distance bus or very slow train to show them another part of China. Because the adopted children came from those parts of China. ALR – So that’s the link between your new book and your charity: they both provide a bridge between children and their culture and history. Xinran – Yes. Yes. Thank you for reading and understanding my heart and my writing. Buy Me the Sky is available here. Xinran's charity: The Mothers' Bridge of Love. Thanks to Wan Ching MAK for help with transcription.